Beat the baking mix, cinnamon, egg, and milk with a rotary beater until smooth (Remember the hand held rotary beaters? Being a leftie, I hated them; they were hard to use!) Fold in the apple. 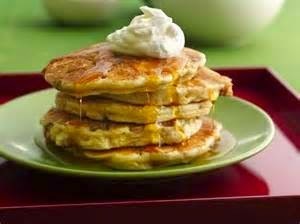 Heat a griddle or skillet to hot (grease if necessary) and pour batter by 1/4 cupfuls onto the hot griddle. Cook until bubbles appear. Turn and cook on other side until golden brown. Serve with whipped butter and warm maple or cider (recipe below) syrup. This makes about 18 pancakes. In a saucepan, combine the sugar, cornstarch and pumpkin pie spice until well blended. Stir in the cider and juice while stirring. Cook over medium heat, stirring constantly, until the mixture thickens and boils for 1 minute. Remove from the heat and blend in the butter.